I wanted a granola recipe that combined the benefits of soaked oats (or other flaked grain, if oats are off your list) and soaked nuts. Soaking the grains neutralizes phytic acid, a mineral absorption blocker. Soaking the nuts starts the process of germination, de-activating enzyme inhibitors. A raw granola that does this is a highly nutritious and a great source of digestive enzymes! There are many ways to go about this, with varying degrees of complexity. My goal was to make it as simple as possible. I aimed to start all ingredients soaking at the same time; and not to call for already soaked ingredients, just in case they aren't on hand. I also aimed to make it flexible to the pantry, using what you have on hand. At the same time, I chose many ingredients that I knew to be rich in digestive enzymes, making this a hearty breakfast or snack that will help digest itself and any other foods you serve at the same time. We love it in kefir! Makes about 1 gallon. For the nuts, seeds, and dried fruit – choose raw, organic and unsulphured. Put the nuts and seeds in a medium bowl along with about 5 cups of warm water (to cover generously). Cover with a towel and let soak overnight in a warm place, 8 to 12 hours. Put the date pieces in a small bowl, along with 1-1/2 cups of water. Cover with a plate or towel and let soak overnight, 8 to 12 hours. You may also use fig pieces or raisins. The figs are an excellent source of digestive enzymes, and I believe raisins are, too, since grapes are on the list. Put the rolled oats in a large bowl, along with 8 cups of warm water and the apple cider vinegar (or Kombucha, or yogurt, or kefir). Cover with a plate or towel and let soak overnight in a warm place, 8 to 12 hours. When the soaking time is complete, drain the nuts and seeds, discarding the water. Coarsely chop with food chopper or food processor. Put in a large mixing bowl. Blend the dates, their soaking water, and all spices and salt in a blender or food processor until smooth. Add this paste to the large bowl with the nuts and seeds. Drain and rinse the oats in a fine colander or sieve. The drier you can get them, the quicker the dehydrating will go. Add them to the big bowl with the date paste, nuts and seeds. Toss gently to mix well. Spread thinly (1/4″ or less) on dehydrator trays that are covered with unbleached parchment paper, plastic liners, or in the case of an Excalibur dehydrator, the ParaFlexx liners. This amount of granola fills almost 5 trays of my Excalibur 9-tray dehydrator. Dehydrate at less than 115 degrees Fahrenheit for 8 to 24 hours. With the Excalibur dehydrator, you can start out dehydrating at 145 degrees Fahrenheit for the first 2 hours, which will kick start the dehydrating but not make the internal temperature of the granola go over 118 degrees – the temperature at which enzymes die. About halfway through the dehydrating time, check to see if the granola peels easily off the paper or plastic lined trays. If it is does this without much stickiness, turn it all over. It is easiest to keep it in big sheets, if possible. Continue dehdyrating until the granola is dried out to your preference. Test frequently. When done, remove from dehydrator and place in a big bowl. Break up the sheets into bite-sized chunks. With small amounts of the granola in a big bowl and using the pestle of a mortar & pestle works well to crush the granola sheets. Mix in assorted dried, raw fruit pieces (or save the fruit and add to the bowls when serving). Let it cool fully before transferring to an airtight glass jar for storage. When ready to eat, place in bowl and add fresh or dried fruit, along with raw honey and raw milk – the latter two are excellent sources of digestive enzymes! This post was featured in The Great Granola Round-Up: 31 Deliciously Nourishing Recipes! Yummy! I love that your recipe soaks everything at the same time- this would be great when I’m out of crispy nuts (which I find is alot!) Thanks for sharing- can’t wait to try it! .-= Shelley´s last blog post… Real Food Eggnog- all natural, raw dairy =-. I feel stupid for asking, but what is the reason for soaking the dates? The only reason I know to soak dried fruit is to plump it up. But if you are going to dehydrate it anyway . . . . Or is it to make it more pasty for mixing purposes? I may be wrong, but I think enzymes die at a temp of 118 WET and 150 dry. So you could decrease your dehydrating time by upping the temp and still be safe. PS – I soooo want a dehydrator now! I’ve never done soaked granola, but I really, really should and I know it. Maybe just in the oven, which would kill the enzymes but at least not have the phytates…if they’re a problem after all, that is. More research needed! .-= Katie @ Kitchen Stewardship´s last blog post… Guest Interview at Catholic Mommy Brain =-. Peggy – The only thing I can think – if the enzymes in the raw milk (or kefir or yogurt) and the enzymes in the nuts/fruit – are not enough to help with the digestion, see if taking an enzyme supplement helps. This would rule out whether it is an issue of needing more digestive enzymes. (I used to get gas from lots of dried fruit – ironic since some of them are supposed to be high in digestive enzymes. Dried fruit digestion needs amylase.) If he still has gas, perhaps you’re dealing with a sensitivity to the oats – maybe he needs them cooked all the way. Also, are you soaking the oats in warm water in a warm place to ensure proper soaking? This was just reaffirmed for me recently. I love your idea for the jars of flavor toppings! Katie – Also, I think this granola would be considered wet? All the ingredients are going in the dehydrator just after soaking. Mmm, I haven’t made granola since I found out about soaking. This soaked granola looks pretty easy! The new icons you’ve added to your blog’s sidebar are a nice touch. I made this for a while to try to wean hubby off boxed cereal. I made the granola plain, then put different flavor combinations in jars for “toppings” like chocolate nibs plus shredded coconut, dried apples tossed in cinnamon, raisins with almonds, etc. The granola gave him terrible gas! I was hoping that soaking would keep that from happening, but it didn’t. Any ideas? He is so hooked on boxed cereal and it’s really our last dietary holdout to the “old” food rules. .-= Peggy´s last blog post… Family Food Times: Birth of an Activist =-. Wardee, you’re also giving ME major dehydrator envy! .-= Kelly the Kitchen Kop´s last blog post… Dinner With Our Bible Study Friends (What are your favorite potluck dinner recipes?) =-. Hi, Kelly! I am really enjoying my new dehydrator, and I waited a long time to get it. I hope you’ll get one soon. 🙂 It is so useful in a healthy kitchen! I really want to make this. So what’s the next best option if you don’t have a dehydrator and your oven only goes down to 170? Tara, you can bake it in your oven at 170. Spread it out on cookie sheets lined with parchment paper. Keep an eye on it and stir/flip it as necessary to prevent burning and to facilitate even drying. I don’t know how long it will take. This recipe would probably fill four cookie sheets, so you might want to halve it. You’ll lose the enzyme benefits from the 170 degree oven, but you won’t have enzyme inhibitors or phytic acid to get in the way of digestion. But… since you’ll lost enzyme benefits anyway, you might want to increase the temperature to speed up the process. Have fun and let me know how it goes! I use to make it by the oven before I got my dehydrator. You actually only need to cook it for 10 min, turn it over and cook it for another 10 min. I cook mine at a high temperature, 350, because I have already lost all benefit of nutrition that you would want to preserve at 118 degrees. I made this today and it turned out wonderful! I soaked everything overnite – then this morning I mixed it up and baked it until it was somewhat brown and crispy. Yes, I lost the ‘raw’ element, but I figured the overnight soaking was a good start anyway. And I love that this isn’t too sweet. I put it on some homemade kefir yogurt. That’s great, Tara! Did you end up using 170 degrees or higher, and how long did it take? The soaking took care of most of the phytic acid in the oats, so even though you lost enzymes, the grain part is much better for you. I’m happy to hear you liked it! I had two sheets of it and baked them at 350 for a half hour. Then I took it out, mixed them and put back in at 300 for about an hour and half stirring each half hour. .-= Tara´s last blog post… Beet kvass kefir smoothie =-. Thanks for sharing that, Tara. I know it will be helpful for others. A note about baking the granola in the oven: I would recommend keeping the oats and nuts/seeds separate while baking. I made this today in the over (as I do not have a dehydrator) and the nuts cooked much faster than the oats. I didn’t want soggy oats so I kept baking until the oats were dried out, which left my nuts/seeds overdone. So next time I make this, I will use one pan for the nuts/seeds and another pan for the oat mixture and then mix them together after the baking is complete. This is a really great recipe, Wardee! The method creates wonderful crunchy granola chunks. I substituted raisins for dates as that’s what I had on hand, and it worked to lightly sweeten the oats just fine. Hi Wardee! I’m enjoying your website. I had a question about the process of soaking the oats. I understand the purpose is to break down the digestive inhibitors, but does it also leach out the nutrients? I’m always leary of throwing out soaking water when I cook for that reason. What do you know about this? Hi, Cherise! That’s a good question and I don’t really know the answer. However, I do know that of all grains, oats have about the highest amount of phytic acid of any of them. So, even if nutrients were leeched out, the benefit of soaking would outweigh it. And as far as I know, what leeches out in to the water are the sugars and starches – that’s what makes the soaking water all gummy and thick. I never toss my soaking water when I cook grains – I move the whole kit and kaboodle to the stove. So you could do that if you’re worried. But in the case of this granola, you do have to drain the oats and get them pretty dry to proceed with the recipe. just found this recipe, thanks for sharing! Question for you about your oats you soak for just oatmeal… you say your keep the soaking water and cook the oats in it. Wouldn’t the soaked water contain the phytic acid? I always drain and rinse my oats before cooking them. Would love to hear what you know about the soaking water. I usually do my oat granola in the oven per a modification of the Eat Fat Lose Fat recipe-thanks for this suggestion! I also do a similar one with sprouted buckwheat groats in the dehydrator which is really nice–they stay really crisp. I have a question about using crispy nuts in recipes. I usually buy my nuts in bulk and do the whole lot into crispy nuts, so when a recipe like this calls for nuts that’s all I have. Should I re-soak the crispy nuts & follow directions…or just throw them info the mix after the other stuff is done? While I am asking “nutty” questions, I have noticed that most nut meal recipes call for ground almonds, to which we are allergic. Has anyone tried other ground nuts in their place? I don’t have a dehydrator (yet) and baked it in the oven. At one point I actually thought I’d done something wrong, in frustration turned off the oven and forgot about it. Well a couple days later when I preheated the oven for dinner, the smell of the granola rose into our kitchen, and there it was. I pulled it out and was surprised to find it actually looked like I thought it should. I broke it up and even kept some of it in bigger cracker/chip sized pieces. The flavor of it reminded me of rye crisp, which I can no longer enjoy because of the gluten in rye. 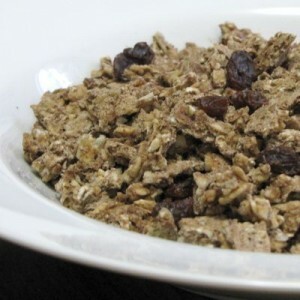 I have a hard time finding granola recipes with a low glycemic index, this one did it for me! And you were right, soaking the oats was totally worth it, I had no gas or discomfort after eating this! It was wonderfully crunchy, and such a treat with agave nectar and rice milk. Thanks for a great recipe Wardee! I don’t have a dehydrator. Is there a way to do this in the oven? Thanks! So this might be a dumb question, but why soak the oatmeal? Also, can you explain to me why thick rolled oats. What if I use “old fashioned” rolled oats? My husband and I made the granola this weekend and I think it is going to be an excellent afternoon snack at work or out on bike rides. I was wondering if you have ever experimented with making a chewy granola? I didn’t know if this would be possible or not. Jamnee- I haven’t experimented with a chewy granola, no. I would love to hear if you come up with something. I would love to make this… just wondering about dates (which I’ve noticed in other recipes you have that look very good and healthy!!). I’ve never bought them or even eaten them before (sad huh?). I’m looking at the options on Azure Standard and I’m really lost. Are most dates pitted? Which would you recommend? Organic or not? The more sugary ones or not? (I think I know the answer to that question, but I’m hoping not so! 🙂 Thanks Wardee! With dates, they’re all pretty sweet. The medjools can be pricey (but oh so good), so usually I go for the cheapest per pound. If you get them unpitted you’ll save money. So I do that mostly. It is not hard to quickly pita bunch of dates for a recipe. Just in case Azure is out of the ones you choose, pick a backup. Enjoy! I am hopeful about trying it again. Any suggestions as to how I could dry without completely ruining it? I don’t want to waste anymore food. I would not use wax paper. I have done granola in the oven on a low temp but I put it directly onto a metal baking sheet and it did not stick. Quick question. Can I soak my oats, wash them with water and then store them for a few days? I was thinking if I dry them out, I could just restore them in glass jars? What are your thoughts? Ooooooooh! I am just now learning about soaking and this sounds like it would be a great recipe to try first. Especially If it ends up being something that is “easy” to eat later 🙂 as far as the drying, I have a “warming drawer” that was already in my house. I am going to put a thermometer in it an see what setting will get me a proper temperature. Fun!!! Grrrrrr, I do not have a dehydrator and my oven only goes down to 150*. If only it had a “warm” setting, i’d be able to make this raw granola. so just double checking the dates or figs should be dried to begin with and then soaked to make the paste…or can you use fresh figs? So I am looking to make this with something other than oats to change it up. Spelt is another flaked grain, but do you have any other recommendations for a flaked GF grain? Hey there, I’m trying to get to the bottom of this whole granola thing (whether it can be healthy or not). Can you check my facts here? 1) Gotta soak the oatmeal first to neutralize phytic acid, aka, “the stuff that leeches minerals out of your body and makes your teeth rot”. 2) Gotta also soak the nuts for phytic acid. Now here’s where other articles come in, like Sarah’s at Healthy Home Economist. She says no to granola, but doesnt seem to address raw granola. Her reasoning is that toasting the granola doesn’t cook it long enough, and that not only do you need to soak the oatmeal in particular, you must cook it well. So then my thought is that raw granola better possess some hefty enzymatic activity to digest the oatmeal in particular. Otherwise, make porridge instead.